Japanese officials insist that the country's whale hunting is authorized. (CNN) -- Australia will take its case against Japan's whaling practices to international court early next week, Australian officials said Friday. "We want to see an end to whales being killed in the name of science in the Southern Ocean," Peter Garrett, Australia's environmental protection minister, told reporters. In a statement, Garrett, Australia's attorney general and the country's foreign minister, said the government's decision to take legal action "demonstrates our commitment to do what it takes to end whaling globally." An international moratorium prohibits whaling, except when done for scientific reasons. Critics say that Japan exploits the scientific research loophole as a pretext for harvesting whale meat that is sold in markets and restaurants. Japanese officials counter that the country's whale hunting is authorized. Hirotaka Akamatsu, Japan's agriculture, forestry and fisheries minister, said Friday that he was disappointed by Australia's announcement. "Our research whaling is approved under the International Convention for the Regulation of Whaling. Japan would not like to worsen the Japan-Australian relationship, but we will continue to insist on this fact," he said. Japan has hunted up to 1,000 whales in the Antarctic annually, according to the International Whaling Commission. The practice has drawn sharp criticism from environmental advocacy groups, who claim it involves the cruel slaughter of species that should be protected. 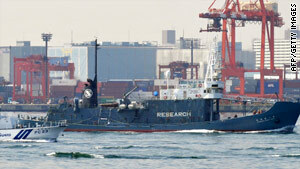 Japan's fisheries agency has said that it wants "sustainable whaling" and also advocates conservation. "Clearly, the acceptance of other cultures' dietary practices and the promotion of cultural diversity is as important as saving endangered species and the promotion of biological diversity," the agency's website says. "If the consumption of whale meat does not endanger whale species, those who find the practice unacceptable for themselves should not try to impose their view on others." Australian officials said Friday that they were determined to stop Japan from hunting whales. But they stressed that their government's plan to take the case to the International Court of Justice in The Hague, Netherlands, is not a sign that relations between the two countries -- close allies and trading partners -- have soured. "The government's action today reflects a disagreement in one element of a relationship that is deep, broad and multi-dimensional," the statement said. Australia's announcement came as an anti-whaling activist was facing charges in a Japanese court. Prosecutors allege that Peter Bethune, an environmental activist from New Zealand, jumped aboard a whaling ship and attempted to make a citizen's arrest of the captain in January. He was arrested and brought back to Japan to face criminal charges, including trespassing, damage to property and assault. The International Whaling Commission is scheduled to evaluate existing whaling rules at its annual meeting in June.